Welcome to the weekend everyone! Be sure to visit a local arcade if the opportunity allows! Today’s newsbag is very heavy on videos so let’s get to it! Star Wars Battle Pod Hoth/Vader Trailer – We’ve been getting a lot of news about upcoming Japanese releases this week and while Star Wars Battle Pod is included in that, this is one that we know for certain Western locations will get to enjoy. If you missed it, check out our interview with the lead producer of this game that was also posted this week. This new trailer shows off the Hoth and Vader’s Revenge levels; of the two I only got a chance to play Vader’s level. If anything, this trailer shows why Star Wars is such a great license to use for an arcade game, it hits all of the action high notes we love to get out of arcade-style experiences. Some websites are reporting on this trailer but they are incorrectly suggesting that the game was released on Jan. 23rd. Let me stress again, the game has not been officially released yet – I checked with Bandai Namco Amusements directly and they stated that Dave & Busters will get the game next month in Februrary (covering most/all locations); March will be the release for other locations to pick up around the world. So don’t go out into the wild expecting to find this quite yet, hang tight! Real Life Pac-Man Superbowl Commercial – Speaking of Bandai Namco, Pac-Man is set to get some high-profile attention with the upcoming Super Bowl event. In the US, the commercials that play during the event are sometimes more talked about than the game itself, since marketers pull out all of the stops to create something memorable. Just a note/warning where needed for younger viewers, this is a beer commercial. Full Throttle Pinball @ EAG2015 – one of the items I was waiting on from EAG was the presence of newcomer Heighway Pinball and their new pinball table, Full Throttle. Given that Heighway is a British company, it made sense for them to be there but in the media I did get my hands on, they were unfortunately absent. It is a little odd since judging by the video below, they had a very nice looking booth. This was produced by Heighway Pinball and the Full Throttle game is available now. Duo Drive by UNIS – I received a promo email from Universal Space (UNIS) this week for a new kids videmption game they are promoting called Duo Drive. Aside from the kids theme, it is interesting in that it goes the route of asymmetrical play, the left cabinet uses a steering wheel for a car, the right side is a motorbike. Here is a video of the game in action, which is available now. Dark Escape 4D Brasil Edition – I decided to check in with Brazilian-based distributor and manufacturer DiverBras to see if they had anything new. Apart from a new video kiddie ride they are still focusing on making completely new cabinets for racing games and not really spending a lot of resources on developing original games. 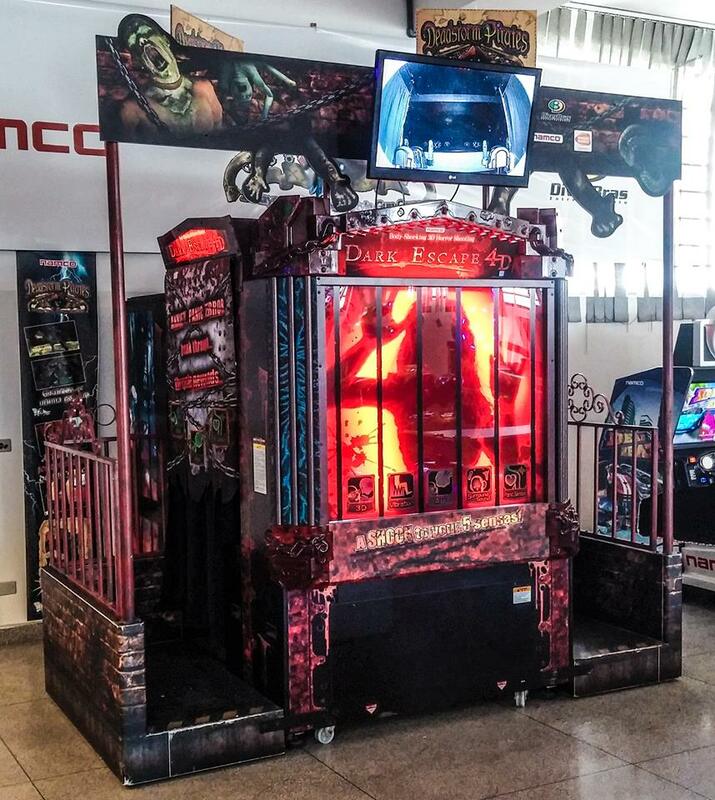 One of their new cabinet redesigns I found to be rather interesting – their take on Bandai Namco’s Dark Escape 4D. They actually left the main cabinet alone but enhanced it with the siderails that appear to be from the game and the overhead banner. It’s a great way to improve a cabinet that is already eye-catching. They also have a modified Dead Heat Twin cabinet you can see to the right of the picture. Name That Game #32 – Of the games we had to guess on last week, only Taito’s Super Qix is one I’ve spent any quality time with. Although given the choice I would prefer Volified, which came along a year later. 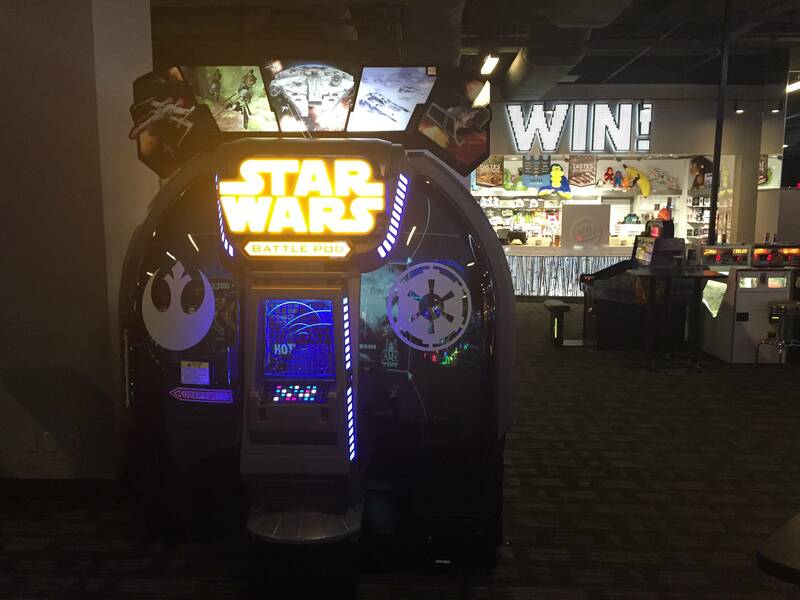 Here’s a picture I took of the Star Wars game yesterday around lunchtime at the Dave and Busters by my house. Is it February already? A location test is different from an actual full release, they have been testing at different D&B locations since October. If Bandai Namco themselves state that the full D&B roll out is Feb, then why would they lie about that (they also stated to me that there are some loctest units out there, which is what you are seeing). I don’t think you’re right. I just called the next-closest Dave and Busters and they said they just got one as well. Sorry but I’m not going to believe a random anonymous internet poster who has never posted here before over a Bandai Namco employee who has been directly working on the Star Wars project which is where I got my information. I there anything news about the official release. I saw severals website that said 23 january ? for d&b exclusive ? or us release is done ? 4gamer says the green button (near the left stick) is available . Is it true ? and what is the difference between the 2 view ? Aside from Japan there wasn’t really an “official date” – Namco got some units ready to ship at the end of January and started delivering them to Dave & Busters. The official line from them was “Feb. is Dave & Busters release, March for the rest of the world”. Tracking locations is extremely difficult in the industry – not every sale location is tracked by the manufacturer since you have blind shipments as well as operators who move their games around often without reporting that move to anyone. Most tracking is done by the end users on websites like Aurcade.com. That has an entry for SWBP but it needs to be updated with the correct year and at least Dave & Busters locations added. Wow. Sorry I hurt your feelings. No need to “believe” me anyway. Call them yourself. I was in Culver City, CA yesterday and called Hollywood, CA today. No feelings hurt – you are one person claiming that all D&Bs are launching with them now based upon two locations possibly getting them. I’m not going to change the reporting based upon that. I’m more inclined to take Namco for their word that the launch is when they say it is. Could certain locations be getting some early? Sure. But it is still erroneous for websites to go around claiming that the official launch was Jan. 23rd. Number 2 is Dark Edge by Sega.